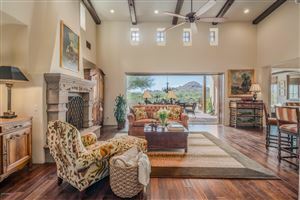 Our featured listing is newer to the market and is located in the up and coming neighborhood of Sonoran Foothills in North Phoenix. Practically everything in this house has been upgraded and updated with meticulous detail and it’s better than a new build because it’s ready now without the wait! There is a new, energy efficient AC unit, a new hot water heater, a new water softener and a new CALspa hot tub. This home would be ideal for first-time home buyers, couples looking to downsize from a large family home, or for a seasonal resident or someone looking for a vacation home. The community is gated, the HOA maintains the front yard and the backyard is practically maintenance free so the home is easy to lock and leave! The kitchen features a large island, upgraded high-end slab granite counters, travertine backsplash, GE Cafe Series stainless steel appliances, upgraded dark wood cabinets, RO system, and a Blanco composite granite sink. It is an eat-in kitchen with a bar & storage area that features both a wine fridge & separate beverage fridge. The large living area has Bellagio dark wood hardwood floors & built-in JBL surround sound. The large master suite has a private balcony and a generous sized walk-in closet. The master bath has separate his/her vanities with upgraded slab granite, dark wood cabinets and a separate shower/tub. The 2 ample sized other bedrooms are separated by a jack & jill style bathroom. There is also a dedicated office with tons of storage. All light fixtures, hardware, ceiling fans and even light switches have been replaced. Other features include a main floor powder room, laundry room and an attached two car garage (20ft wide x 22ft long x 9 1/2ft tall). The backyard is a private oasis featuring a CALspa hot tub, palms, a zebra lemon tree, hibiscus plants and new irrigation. The gated community features a large community pool and spa, a community park, a community recreation center and well access to hiking and walking trails! These amenities are close by and very well maintained. The home owner’s association maintains the front yard for you also! 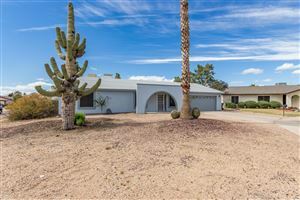 All of these features give allow you to enjoy everything Arizona has to offer such as a large well maintained pool and hiking and walking trails without the drive, all while enjoying a small, easy to maintain private yard of your own. Contact me below if you’d like to schedule a private showing or if you would like more information about the home. I have a detailed features list that I can send to you also.